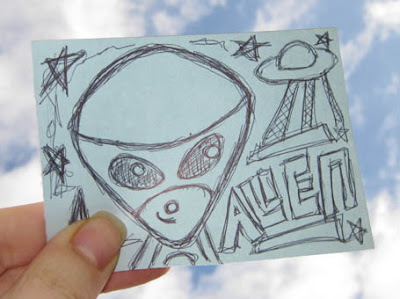 KawaiiPunk - Kawaii Mascot Blog: Alien Abduction? Look familiar? Now… I’m not normally the sort of person to point the finger of blame but, given the wealth of wholly indisputable scientific evidence behind me, not to mention the fact of there being no other reasonable explanation whatsoever for my missing time, I put it to you that you abducted me. And, as my abductor, I think I have the right to ask of you some questions. First and foremost of which is… do you know what I did with my watch? I’m pretty sure I had it on when I went in to the pub, but I haven’t seen it since! Sorry to disappoint you Davey, but I’m afraid it wasn’t me that abducted you. In fact, I think there’s a very distinct possibility that you weren’t abducted at all! Having said that, I may still be able to help you with your watch. Have you looked down the back of the couch? Because according to 99.9% of stand-up comedians that’s where these things usually end up! And that statistic, my friend, really is an indisputable scientific fact!